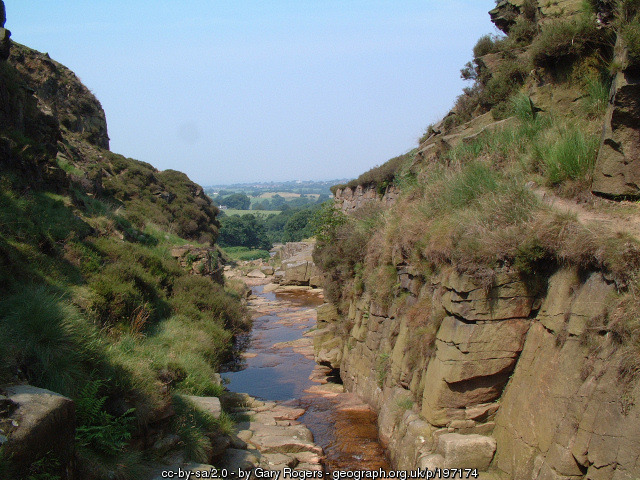 Black Brook defines the Northern border of Anglezarke, and along with the Yarrow, is one of the two main rivers of Anglezarke. The name Black is given due to the colouring of the water, acidified with thick, dark peat. It rises to a source that is 350 metres above sea level, and flowing to a height of 79 metres at Yarrow Bridge. There are two sources of Black Brook, the Great Hill section, and the Eagle Tower section. We will cover both, but will start with the Great Hill leg as this is undoubtedly the larger watercourse, contributing a greater volume to the overall river flow. 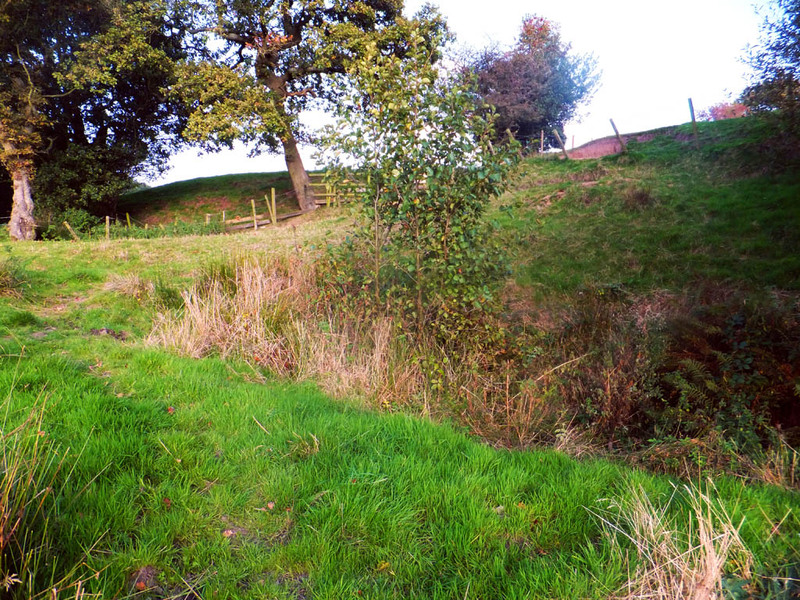 The source of the river here is just South of the summit of Great Hill, near the ruins of Great Hill Farm. At this location, it is known on current mapping as Dean Black Brook. 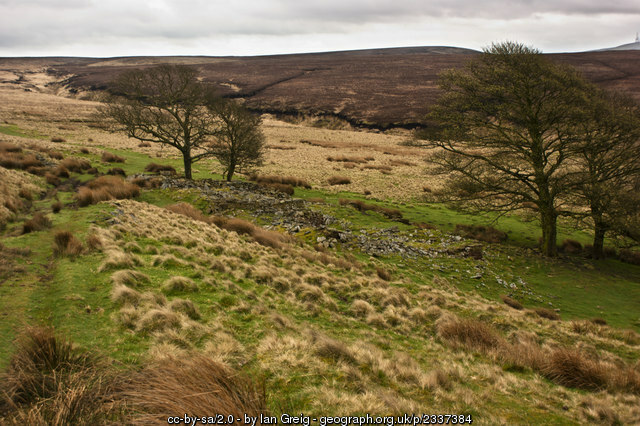 The source of Black Brook is by the ruins of Great Hill Farm. Dean means “valley” and normally applies to fast-running hilltop streams such as this one. This opening stretch of river is very scenic, with Redmonds and Spitlers Edge to the South, Round Loaf – the mysterious burial mound – to the South West, and latterly downstream some superb moorland beech trees. There is a feeder brook that comes in from Anglezarke Moor, which is another route that can be followed to Round Loaf. You can see here the main leg of Black Brook on the left, and the feeder stream from Round Loaf on the right. This river stretch heading down the valley was previously known as Grange Water. Dean Black Brook, above White Coppice. The river (I call it a river, because it generates at least as much water as the River Yarrow) flows into White Coppice and feeds the goit, with the excess overflowing down a weir. It flows round the back of White Coppice cricket ground, and into the the Heapey reservoir chain. Black Brook flows through the man-made channel cut into the base of White Coppice gorge and nowadays flows across the Goit and into the reservoir known as Heapey 6. There is evidence of nine lodges (or reservoirs) at Heapey. The numbering of the Heapey reservoirs is quite a puzzle. None of the reservoirs are numbered on current maps, but they are known by their numbers to the locals, and also to the anglers of the Wigan And District Angling Association, who look after the waters. There are only four which are accessible, being 1, 2, 3 and 6. Black Brook flows through them all. Heapey No1 covers an area of seven acres. Depths range between about 16 feet and about 22 feet. Heapey No1 holds a very large head of carp ranging from 5lbs to mid 20s. There is also a big head of Bream going to around 4lbs plus plenty Roach & perch. In addition there are some good Tench , Chub & Pike. Heapey No2 covers an area of nine acres. The depths ranges from about 16 feet at the east end to over 40 feet at the west end, so angling methods need to be tailored to deep water. Fish include large Bream (over 7lbs), Pike, Carp, Roach and Perch. Heapey No3 covers an area of just under 5 acres. It is a natural-looking water for a Reservoir, and depths are much less than the other waters at Heapey. This water holds mainly Roach, Perch, Skimmers & a good head of small chub which seem to breeding in the stream that enters at the east end of the water. For anglers that like Pike fishing there is plenty of fish in the low teens of lbs. Number 6 is somewhat separate from the other Heapey Reservoirs. Fishing is only possible from the dam wall and a couple of pegs along the north bank, to which access is down a very steep slope. The greatest care should be taken in approaching these pegs. 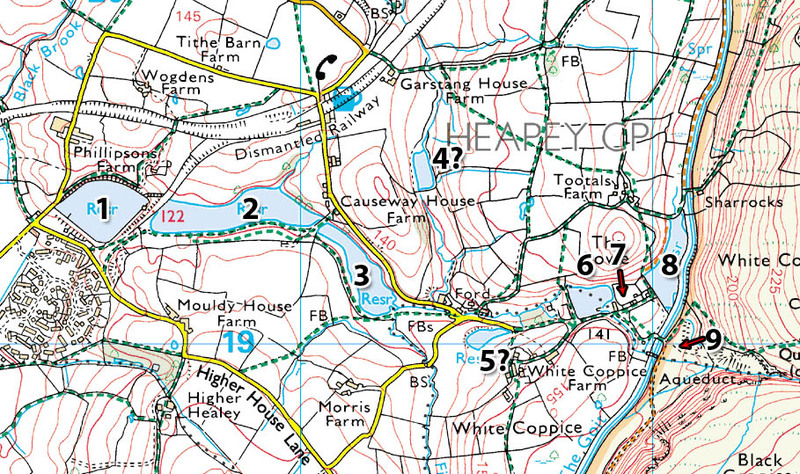 There is a reservoir on the hill behind Causeway House Farm which would logistically be number 4. Number 5 is also logically the reservoir at the private residence on the way to number 6. Number 7 is not on current mapping as it was filled in and replaced by the cottage grounds around the cricket pitch. Number 8 is on mapping, but has recently been allowed to dry out. It used to be Wigan Anglers breeding pond. There was also a Number 9 lodge across the goit, but the dam wall broke and it caused the village to flood, and was never repaired. No-one knows exactly when this happened, but it could well have been August 14th, 1891, when the records of White Coppice School state that five bridges were washed away in the Coppice and the children could not get to school”. The day after, the Chorley Guardian stated that “the streams flowing from the high moorland to the east of the townshio were swollen into raging torrents, carrying everything before them. Great damage was done to White Coppice Mills, which belonged to Mr. A. E. Eccles and are situated at the bottom of the bank of a large reservoir which feeds their boilers”. The mill was almost swept away, and tons of earth in the foundations were carried off. It seems that the reason for the flooding was that “several thousand tons of earth” fell from the hillside into Black Brook. This earth was gradually carried downstream to the goit, where it landed and completely blocked the waterway. This caused the dammed up waters to rush over the Goit bank and thereby flood the village. White Coppice would probably have received the full flow of waters from Roddlesworth and Black Brook combined! Anyway, where Black Brook flows out of Heapey 6, it tumbles down a fantastic weir, round the back of the local nursery, and then across the front of the village cottages and across a ford, making a very scenic spot. The river flows under the road and at this point it is met by the incoming Brinscall Brook. Together, these watercourses flow through the current Heapey Lodges of 3, 2 and 1 in turn. At Heapey 3, the incoming Fill Brook joins the flow. 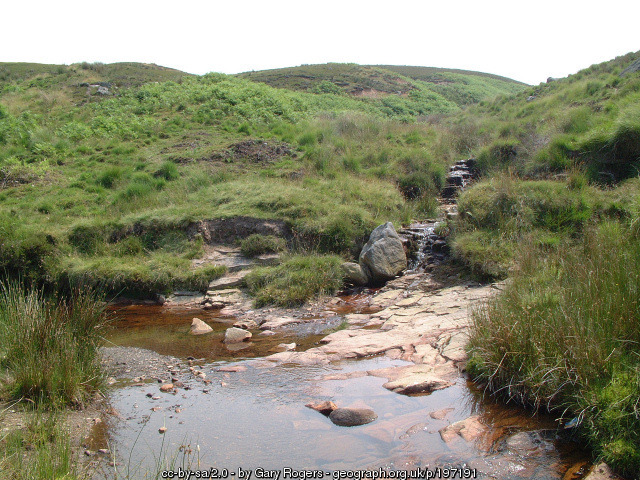 This was formerly known as White Brook, and comes from the outflow at the Northern end of Anglezarke Reservoir. You can see on current mapping a boundary line through the middle of Anglezarke Reservoir, this was the continuation of the brook. This was then known also as Black Brook and it appears that it was fed here from the River Yarrow downstream of Alance Bridge. The Yarrow actually appears to fork out North and South to feed not just Black Brook and the Yarrow continuation itself, but also Middle Brook, which gives the retail outlet behind Bolton Wanderer’s ground its name. As we were… back at Heapey… at the outlet of Heapey 1, the river is culverted and re-appears by the new housing estate at Kittiwake Road. This section has several weirs, which can be heard loudly cascading their white noise over the leaps. Here, it is joined by another leg of Black Brook, which starts a short distance northward near to the property known as Eagle Tower. 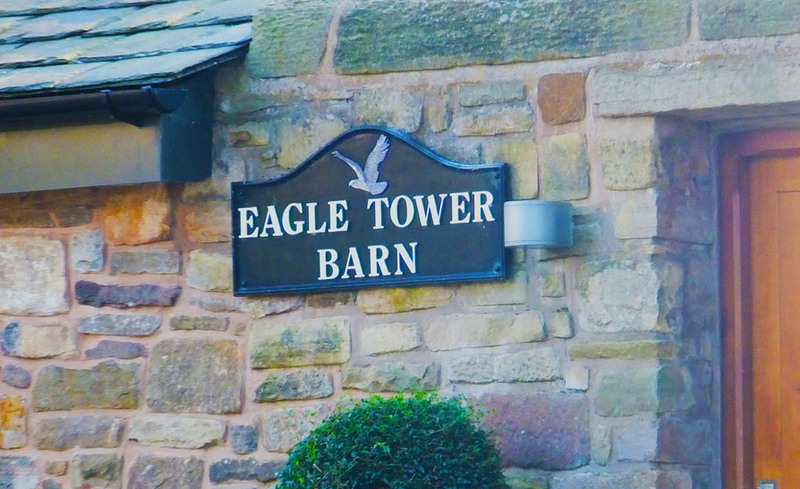 Eagle Tower is an interesting building accessible from the track down the side of St. Barnabas Church in Heapey. The lintel on the property is dated 1704, and is also engraved with M over IY. The source of this section of Black Brook comes from two places – the front of the house, just south of the entrance, and also further back in the fields behind. 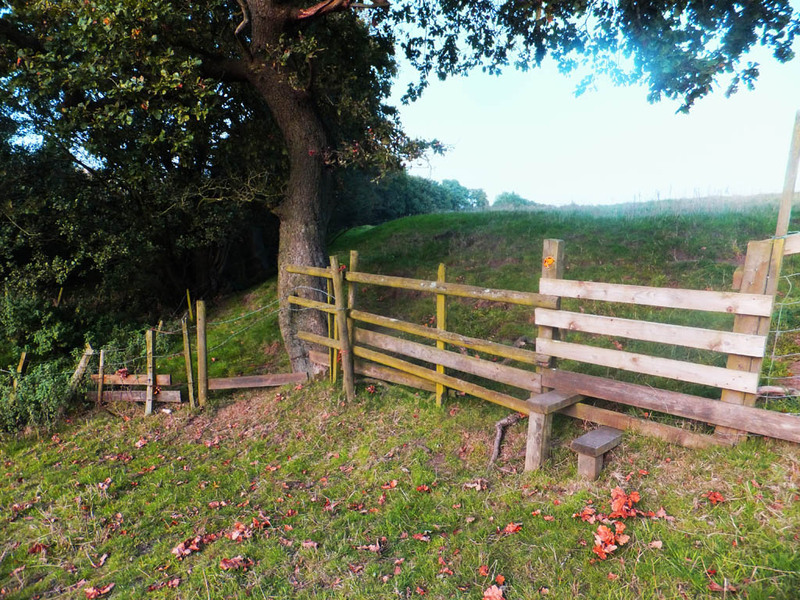 This is easily accessible from the White Coppice area as shown below. 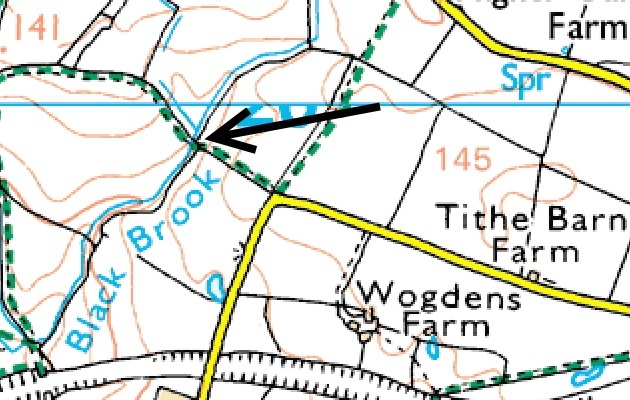 Black Brook clearly labelled near Eagle Tower. Parking is not easy here, however – you can probably get in about 100 yards down the road to the South. Black Brook is itself fed by a Tan House Brook which is a feeble river fed a short distance Northward near the Red Cat restaurant. The small cutting in the centre of the picture is the fluctuating source of the brook. Black Brook runs beneath the old Chorley to Blackburn railway, with the arch still standing, and then heads towards Bagganley at the foot of the Nab. This section runs past Temple Fields, previously known as Park View, which is a row of old cottages by a public footpath. The two Black Brooks meet at Lower Healey near Top and Bottom Lodge. These served an old factory called Witters. Since the factory closed it is beyond doubt that the water quality downstream has improved immeasurably. The river flows through pleasant farmland, underneath the M61 motorway, under the Leeds-Liverpool canal, and through the urban outskirts of Chorley where it was known as Bagganley Brook, before joining the River Yarrow at Yarrow Bridge on the A6. This area of Healey was once a royal park, the home of the Parkers. James Parker had enemies in 1480, people who destroyed his goods and maimed his cattle – they even tried to put a curse on him. 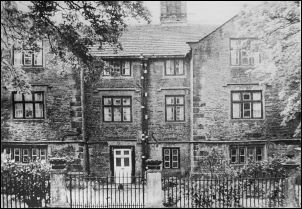 There was a Bagganley Hall by Black Brook, too, which was demolished during the construction of the M61. This hall was said to be haunted – by the ghost of James Parker himself! Bagganley Hall by Black Brook was demolished during the construction of the M61. Black Brook now flows beneath the Leeds Liverpool canal, past Cowling Mill and then on to join the Yarrow. I mentioned earlier that I like to call Black Brook a river – well, where it joins the Yarrow here, people used to say it shouldn’t be called Yarrow Bridge at all, it should be called Weir Bridge after the nearby water feature, or failing that, Black Brook Bridge! There is some good reading about the Black Brook valley on a Chorley History Society article here. Black Brook often seems to play second fiddle to the Yarrow, but it evidently shouldn’t be so.